Hillary Clinton has a long history of using “Projection” to attack her opponents and this campaign cycle is no exception. This series of MEMEs expose her Hypocrisy on the 2016 Campaign Trail. 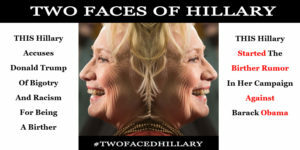 Click Here for more Two-Faced Hillary MEMEs – Feel free to download or share on Social Media!